Mercedes-Benz has confirmed plans to launch a new SUV, sitting between its GLA and GLC models and expected to start at around £30,000 when deliveries begin next year. Previewed in concept form at the Shanghai Auto Show, the GLB will place more of an emphasis on practicality than rivals such as the Range Rover Evoque and Volvo XC40. With boxy dimensions and a long wheelbase, Mercedes-Benz says the SUV will be available as a seven-seater. The rear-most seats are a pair of single seats, able to fold flat into the boot floor to increase load capacity. These will be comfortable enough for two adult-sized occupants, says the manufacturer. The dashboard is similar to that used in the B-Class, with a widescreen cockpit display facing the driver and functions controlled via the MBUX infotainment system. The concept car is powered by a four-cylinder petrol engine combined with an eight-speed dual-clutch automatic transmission, producing 224PS and 350Nm of torque. Expect the production line-up to mirror that of the GLA, however, including lower-powered petrols, 2.2-litre diesels and potentially a hot AMG 35 model. All models are expected to feature 4MATIC all-wheel-drive, allowing drivers to switch between drive modes to alter the system's characteristics. 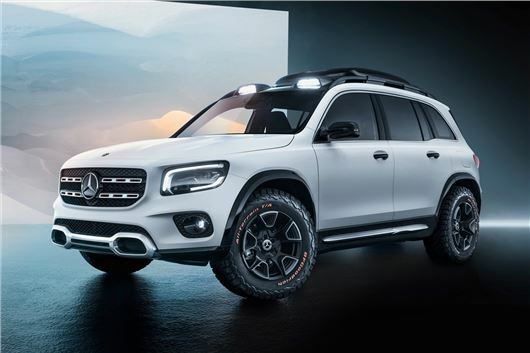 Mercedes-Benz is emphasising the off-road capability of its GLB, with an off-road mode which splits torque 50:50 between the axles. The production model is expected to look very similar to the concept, and will go on sale early in 2020. Prices will be announced nearer the time.